The Compare Lists Assistant add-in for Microsoft Excel will quickly and easily align and compare two lists or worksheets. It is compatible with Microsoft Excel 2007 to 2019 and Office 365. It will identify new and deleted rows and any cells whose values have changed. 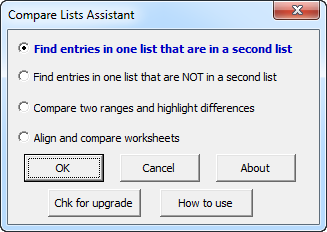 Or you can use the Compare Lists Assistant to compare two lists and have it color or copy the rows which are in both lists (or the rows which are not) to a new worksheet. To learn how to use the Compare Lists Assistant, just click on the the "How to use" button. This will open a help and exercise file with step by step instructions.